A series of posts chronicling my studying this book containing 90 short sections; It’s a large, open-ended collection of ideas and vignettes on Parkour. A key point from the following podcast is the idea that resilience is not a “broad” skill, but rather something that you develop in a particular aspect of your life. Being resilient in social circumstances is not directly related to being resilient in a violent (eg, combat) circumstance. So that’s something to keep in mind: In Parkour, we’re practicing and developing our resilience in the context of MOVING, and moving is something we do every day. So that’s what we’ve taken, that idea of resilience and we’ve applied it to human beings and we tell people, you should just bounce back. Bounce back, bounce back. I actually believe human beings can’t bounce back. The reason why you can’t bounce back is because you can’t go back in time. So the 19 year old Marine who leaves for Afghanistan is never going to be 19 again. Parents who lose a child are never going to be the same parents again. The entrepreneur whose business goes bankrupt is never going to be the same entrepreneur again. So what resilient people are able to do is not to bounce back from hardship but they’re able to integrate hard experiences into their lives in such a way that they become better. That’s what I think is really at the heart of resilience. The link it to a transcript of a podcast, (I recommend just skimming the transcript,) from my ridiculously long queue of podcasts. I was skimming through the list culling a few episodes and realized this one was apropos of the current section from Thibault’s work. I can think of no better personal compass than that simple question. I whole-heartedly agree with its sentiment; that exploring your own concept of “greatness” is the single most important thing you can do. Each of us will come to a different answer; potentially very different answers. But, the act of honestly exploring your own conceptions, and the act of self reflection, are what will move you in a positive direction. I had already begun embracing this idea of seeking the greatest version of myself. As part of that effort, I took up a personal Oath which clearly reflects the idea. Thibault’s section 4 is about seeking personal greatness and striving to constantly improve. That’s clearly a “big picture” goal involving one’s entire self. But we can also use this idea of “closing the gap” to investigate our every-day description of what Parkour is. When asked, many people say that Parkour is about “efficiency”. They say that Parkour is about “moving efficiently” or “getting from A to B efficiently.” (“Quickly” is also used.) Alternatively, there are many people who dislike the “efficiency” description. Some prefer “personal expression through movement”, “pushing the boundaries of human movement”, or even simply “freedom”. There are many alternatives to the “efficiency” description, but it is undoubtedly one of the most dominant descriptions. Where did I stand before reading this section? If you practice Parkour, you will be asked (and often! ), “What is Parkour?” I realized I would do well to have a one-sentence answer to that question. I’ve found that people are pleasantly surprised when I have a clear, one-sentence answer. Almost everyone asks further questions and a conversation about Parkour grows naturally from there. My one-sentence answer is: Parkour is using challenges to improve oneself. Point “A” is here; the me of today. Point “B” is there; the me of tomorrow. Over the last few years it seems I have — finally! — learned some key lesson about pace; the idea of enjoying the journey. The idea of focusing on what I can control. The truth that some of these projects I will not finish, some places I will not see, and some people I will not manage to spend enough time with. These ideas are patently obvious and unequivocal, but learning the Lesson, and deeply and truly making it part of your work-a-day life and personal philosophy takes effort. Years ago I started journalling as a form of self-reflection. It enables me to look back. Sometimes it’s a travel log, but mostly it’s a “this is what I was thinking” log, a glimpse at what I was working on, inspired by, or frustrated by. After a large amount of writing and thinking I gained enough perspective to start removing some things, and changing others. I learned to say ‘no’ to some things I would have taken on in the past, and learned how to rearrange other things to make more space. But only recently have I found myself turning more often to look forward, rather than back. What would the best possible version of myself do? Walk the Earth with eyes turned skyward. Point A to point B, efficiently. I reached section 5, and got stuck. It’s obvious the key idea of section 5 is mindfulness. So I started by thinking about “mindfulness in Parkour practice.” But I wasn’t able to find a compelling thread to unify my thoughts. I came away from a few writing sessions with nothing of value. Eventually it occurred to me to circle back and reconsider my writing process. What exactly does the idea mean? Do I already know and understand the idea? How does it relate to my Parkour practice? What other areas of knowledge does it relate to? But section 5 is already short and to-the-point and doesn’t need to be unpacked. I am actually writing something about section 5 now that I have a different plan. Mindfulness is an inward directed practice of contemplation. It is a continuous process of being present. For me, because it was initially unfamiliar, it was more difficult to approach than the obvious physical activities such as running, jumping, and climbing. But after some practice, it became a critical part of the foundation on which I’ve placed many other parts of Parkour. There are many ways to practice mindfulness at large in one’s life. For example, Leo Babauta, of Zen Habits, has a great piece titled, 9 Mindfulness Rituals to Make Your Day Better I am a firm believer that mindfulness across the full breadth of daily life yields big benefits. But in this post, I’m focusing on the practice of mindfulness within Parkour. In many ways, mindfulness is like any other skill that you can practice intentionally. But unlike other skills, failing to be mindful leaves me with blindspots. These blindspots, which are closely related to the Dunning Kruger Effect, create space for “unknown unknowns” to lay hidden. Worse, lack of mindfulness is akin to: Failure of attention, which leads to injury; Failure to notice moods and emotions, which leads to loss of interest in the short term and training plateaus in the longer term; Failure to notice signals from my body, which leads to chronic injury and developmental imbalances. One option would be to set out explicitly to practice mindfulness. (“Today, instead of practicing vaults, I’m going to practice mindfulness.”) Unfortunately, I would need to be highly mindful in order to stay on task working on being mindful. But, if I could be that mindful, I wouldn’t need to practice being mindful. (Which is a Catch-22 that makes my brain hurt before I even start doing anything.) In the end I find that saying, “I’m going to practice mindfulness,” is simply too vague to be motivating. Another option is to passively rely on fellow traceurs, or coaches, to call me out for “not being mindful”. (Or for them to set up specific “mindfulness practice.”) But mindfulness is too important for me to simply rely on other people to hold me to it. It’s much better for me to practice it intentionally. So how do I practice mindfulness? I think of it like tied shoelaces. It’s important my shoelaces be tied, but I don’t obsess over them by constantly checking my shoes. I simply tie them when I notice they are untied. I practice mindfulness when I notice I’m not being mindful. So when I notice, what can I do, exactly? I locate a small jump. The jump needs to be well within my ability; not something risky or overly tiring. I want a relatively easy jump that I know I can do without thinking. It must be any easy jump, because there can be no nervousness or doubt. I’m purposely selecting a jump to set myself up to be lulled into NOT being mindful. I physically prepare to jump. I position myself, arrange my limbs, engage muscles, etc. Eventually I arrive at that point in space and time which would normally be the last point before I jump. At this exact point, I wait. I am poised, comfortable, ready, willing and perfectly able to jump. I know I’m in at the correct point when I suspect that if someone startled me, I would jump involuntarily. I find my thoughts are like birds flitting around a cavernous room. Some thoughts are on-task as they seem related to the jump: The way my body feels; The anticipation of being in the air; The expectations of the landing. But depending on how mindful I am, there are more or less other “off-task” thoughts flitting about the room. There’s an ant where I’m going to land. People must be looking at me funny. Gradually, some of the extraneous birds fly away. When I think the number of extraneous thoughts in my head has reached a point where it’s as good as it’s going to get . 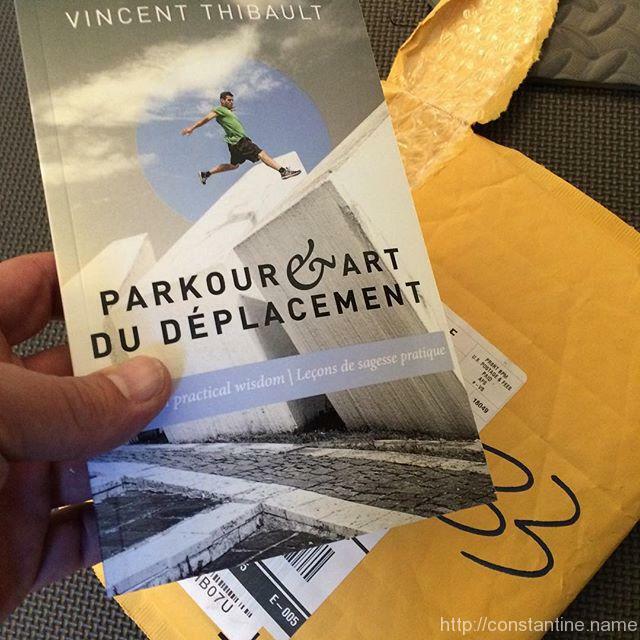 . .
Quick update to point out that Parkour and the Art du déplacement is now available in print or E versions. Happy Sunday to me!! : …mailman rang the doorbell, on a Sunday?!? §6 – I Choose To Fall! I’ve now read the entire book several times, and Chapter 6 never ceases to inspire! I may not be the strongest. I may not be the fastest. But I’ll be damned if I’m not trying my hardest. It ofttimes requires heroic courage to face fruitless effort, to take up the broken strands of a life-work, to look bravely toward the future, and proceed undaunted on our way. But what, to our eyes, may seem hopeless failure is often but the dawning of a greater success. It may contain in its debris the foundation material of a mighty purpose, or the revelation of new and higher possibilities. Failure is often the turning-point, the pivot of circumstance that swings us to higher levels. It may not be financial success, it may not be fame; it may be new draughts of spiritual, moral or mental inspiration that will change us for all the later years of our life. Life is not really what comes to us, but what we get from it. The application in the Ways is to falls in life. To be able to take a disaster or a great failure, with the whole personality, without shrinking back from it, like the big smack with which the judo man hits the ground. Then to rise at once. Not to be appalled at a moral fall. Yet it is not that it does not matter. The judo man tries by every means not to be thrown, but when he is thrown it does not hurt him and in a sense it does not matter. It matters immensely, and yet it does not matter. “Lemons” simply reminds us that sometimes we need to make lemonade from whatever lemons we find before us. I am acutely aware of this aspect of Parkour; This searching what is right in front of me for something to do. Initially I felt like a one trick pony. Every time I’d be faced with some little area, I’d stare at it thinking, “I can only do, literally, a step vault. What am I going to do here? !” Yet somehow, I manage to force myself to stand in the face of my ineptitude and to search for inspiration. Eventually I came up with a sort of “wedge” for the problem. I would seize on, literally, the first thing I could think of. Often that would be something even I felt was ludicrous. But this first ludicrous movement, got me moving. (That’s the wedge.) From there, I invariably saw something else. Usually the second thing was also ludicrous, but sometimes it was better (whatever “better” might mean to me at the time). So I’d change to doing the second thing. I’d throw my shame and ego to the wind and start doing repitions of whatever that first ludicrous thing was, then the second thing if it was better, and so on. Sometimes, I could only see a single thing which I feared, and so I’d start with ludicrously simple progressions to the thing I feared. One day, I participated in the most surreal jam session. On a sign. It was just a slightly sloped, big flat sign with a map on it and four skinny legs into the ground. One person did something near it, “interesting,” I thought. Then a second person did a little sliding thing across it. And I thought, “I wish I could do something on there.” And the wedge happened automatically and I thought, “I can try this ludicrous move.” And I tried it, and someone said, “Craig, what are you doing?”. And I failed. And someone else said, “OH! That’s totally a thing!” And in the blink of an eye a dozen world-class traceurs — people whose abilities all boggle my mind — LINED UP to play on this little sign. And for what seemed like eternity, we all took turns trying crazy stuff on a sign, at night, in a busy public square. And passers-by stopped and some even applauded or cheered. And we all ate ice cream and drank milk-shakes as we waited our turn and pondered our next go. And I for one wanted it to never end. It was the greatest lemon pie I have ever tasted. Early on a brisk Saturday morning, I was struggling to find the motivation to put solid effort into a quadrapedie workout. During a break, I was talking to someone about how I’ve recently been dropping goals. I’ve always had a laundry-list of goals such as getting to a free-standing hand-stand, or a specific number of pull-ups. But I’m learning — slowly — that blindly chasing goals only leads me to injury and failure. Tenaciously refusing to let go of a goal can be counterproductive, even overtly unhealthy. I find it’s easy to learn, and easy to get some new bit of knowledge stored in my mind. But it is difficult to get my instincts and feelings to change to align with that new knowledge. So it is with my processes and goals: I know it’s all about the process, but my instincts and habits are to create goal upon goal. I regularly get caught up chasing the goals, and lose sight of the process. How far ahead can I see? How wisely can I set my goals? Do I chase them blindly causing my journey to veer off? Or do I have a broad spread of goals that firmly draw me in my desired direction towards the horizon, and ultimately, to the end of my journey?